Durga puja or Navratri is an important festival of 'Shakti worship', where the female Goddess is worshipped in all her prominent forms. Across the world this celebration of 'woman' as a symbol of power is an annual event, but the #metoo and #metooindia campaign or attack on Aniket Mitra's depiction of menstrutating Durga is a living proof that though there has been a sea change in our approach, the real work is just about starting now. Women are entrepreneurs, CEOs and CFOs as well as mothers, grandmothers, daughters and sisters. Yet we still have a lot of work to do, still we face endless hurdles to reach that top position. According to a poll for the Young Women's Trust, almost a quarter (23%) of females aged between 16 and 30 have been sexually harassed at work but only 8% have reported it. Among the reasons for not reporting workplace sexual harassment were fear of losing their job, very similar to what actress Tanushree Datta faced. Then there is the problem of visibility of women across nations. Indra Nooyi has helped in increasing the visibility of women's representation in top positions. Though doctor Who is now a woman, a recent Forbes article found that there are only 24 women CEOs of Fortune 500 companies in the UK, down from 32 just a year ago. In 2015, Baroness Ruby McGregor-Smith CBE, the former CEO of Mitie Group Plc, the only Asian female to head an FTSE 250 company said, “No one has ever asked me about the challenges of race, they've only ever asked me about the challenges of being a female.” But every person who is passionate in fighting for women's issues, dreams of a day, when the pursuits are not needed any more. People have not been able to dampen the indomitable spirit of women, especially when it comes to their career growth and development. Ambitions, challenges opportunities, you name it, women are not only mastering but writing the rulebooks. 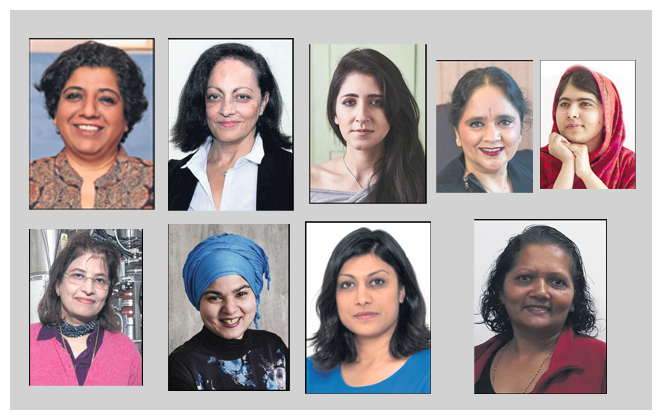 Here is a short list of such some very talented women who represent today's 'Shakti', a symbol of empowerment, strength and ideal, from various walks of life. A civil servant by day, Anoushé Husain is a paraclimber in the UK and an ambassador for leading charity for amputees and those with limb difference. Born missing her right arm below the elbow, living with multiple health conditions, a cancer survivor, a Muslim and coming from an ethnic minority, Anoushé has never let what society or culture thinks she should do limit her or dictate the direction of her life. She is constantly breaking the mould and challenging not only her own beliefs about her own potential but also that of society and her own culture. She won the Asian Achievers Awards for the Sports category this year. Darjeeling Express' Asma Khan, is famous for her all-female kitchen staff, that started from a series of supper club. Asma who is from a Royal family of Aligarh in Uttar Pradesh with a Bengali mother, was born and brought up in Kolkata. In 1993, she was working as a constitutional law scholar in Cambridge, when she decided to travelled back to India to cook in the kitchens of family members, also mastering their recipes and studying the 1930s Royal Nawabi and Mughal cuisine. In 2012 she decided to launch her first ever supper club, and opened Darjeeling Express at Kingly Court in 2017. Asma will be the first British chef to appear on season six of award winning Netflix original series, Chef's Table. She launched her cookbook Asma's Indian Kitchen on October 4th. In January 2019, Asma is planning to go to Northern Iraq, where Khalsa Aid is supporting young Yazidi girls who have escaped from their Isis captors and become self-sufficient by starting their own business. Dame Pratibha Laxman Gai DBE FRS FRSC FREng is a British microscopist and Professor and Chair of Electron Microscopy and Director at The York JEOL Nanocentre, Departments of Chemistry and Physics, University of York. She created the atomic-resolution environmental transmission electron microscope (ETEM) and is an outspoken advocate for women with careers in science. Gai has pioneered advanced in-situ electron microscopy applications in the chemical sciences. With Edward D. Boyes, she co-invented the atomic resolution environmental transmission electron microscope (ETEM), which enables the visualisation and analysis on the atomic scale of dynamic gas-catalyst reactions underpinning key chemical processes. Her research has helped to understand better how catalysts function, leading to valuable new science. Her microscope and process inventions are being exploited worldwide by microscope manufacturers, chemical companies and researchers. Nimisha Raja pioneered the concept of air-dried fruit crisps, launching the first product to the UK market with her innovative brand Nim’s Fruit Crisps. As an entrepreneurial café owner and mum, she was frustrated with the lack of a genuinely healthy and tasty snacking alternatives and set out to create a product that not only she would enjoy, but her daughter would too. Nimisha developed her products first sourcing exceptional quality fruit and then perfecting the process of air-drying them for crispness and sweetness of flavour. Tapping into the demand for genuinely healthy lunchboxes and on-the-go and after school snacks which don’t compromise on taste, her crisps quickly grew in popularity, breathing new life into stale and stagnant snack aisles. Passionate about British manufacturing, Nimisha took a step to improve the quality and consistency of her already award-winning products by setting up her own UK-based factory. Anushka Asthana is a British journalist and former newsreader. Since early 2016, with Heather Stewart, she has worked as the joint political editor of The Guardian newspaper. Asthana was born in Scunthorpe, Lincolnshire, and raised in Greater Manchester. Her parents, both doctors, moved to the UK in 1970s from New Delhi. Asthana joined The Observer as a general reporter in 2003, spent several months at The Washington Post in 2006. later she was a political correspondent for The Times before beginning to work for Sky News in 2013 as a political correspondent. Asthana was appointed in December 2015 as the joint political editor of The Guardian, in a job share arrangement with Heather Stewart, which began in early 2016. Dame Asha Khemka DBE DL is a British educator. She was principal and CEO of West Nottinghamshire College in Mansfield, having joined the college in 2006. She resigned on October 1st. She was awarded the OBE (Order of the British Empire) in 2008. In 2014, she was elevated to Dame Commander of the Order of the British Empire. Khemka is the fourth woman of Indian origin to be awarded a damehood of the Order of the British Empire (DBE or GBE) since the order was instituted in 1917. She is a Deputy Lieutenant of Staffordshire, where she is a long-term resident. Malala Yousafzai is a Pakistani origin female education activist and youngest Nobel Prize laureate, now living in the UK. She is known for human rights advocacy, especially the education of women and children in her native in Swat valley in northwest Pakistan, where the local Taliban had at times banned girls from attending school. Her advocacy has grown into an international movement, and according to Pakistani Prime Minister Shahid Khaqan Abbasi, she has become "the most prominent citizen" of the country. Based out of Birmingham, she founded Malala fund, a non-profit organisation and in 2013 co-authored I am Malala, an international best seller. In 2014, she was the co-recipient of the 2014 Nobel Peace Prize along with Kailash Satyarthi. She is currently studying for a bachelor's degree in Philosophy, Politics and Economics at Lady Margaret Hall, Oxford. Nikita Gill is a Indian Sikh writer brought up in Gurugram, Haryana in India. In her mid twenties, she immigrated to the South of England and worked as a carer for many years. She enjoys creating paintings, poems, stories, photos, illustrations and other soft, positive things. Nikita realised that she loved writing when she was 12 years old and had just published ger first piece in a local newspaper in India. The desire to connect beyond physical limitations kept her hooked to writing and made her an Instagram star, with 2.5million followers. In 2015, UK-based Nikita started uploading her poems on Instagram, and today she’s a published author with three titles under her belt.